... Separation of the compression chambers on both sides of the impeller permits single-stage, twin-flow as well as two-stage, single-flow operation with only one impeller. Vacuum filter and vacuum safety valve can be integrated as an optional extra in the patented design of the sound absorbers. The sound absorbers can be varied in length, affording flexible adjustment to available installation space. The frequency inverter integrated in the VARIAIR UNIT significantly enhances the performance data of side channel vacuum pumps. It matches the vacuum generators exactly to customer requirements. The patented, sensorless control system that keeps pressure and volumetrie flow constant ensures steady operation, even where differing suction-air rates or pressure levels are demanded. The speed range up to 6000 min-1 can be used to create compact, high-output units. The integrated electronic self-protection feature on the vacuum pumps saves the need for costly accessories, such as safety valves or suction sound absorbers. As no unnecessary suction air is generated, suction noise is kept to a minimum. Matching delivery exactly to the amount of air actually used guarantees optimised energy consumption. Becker’s innovative VASF 50, 80, and 120 range of side channel blowers is particularly well suited to meeting requirements of the type placed on de-centralized vacuum or pressure generators in terms of system integration and operating efficieny by forward-pointing technoligies. Compact design, optimized aerodynamics, wide speed range with extremely low operating noise as well as “intelligent” drive electronics provide the basis for excellent performance and efficiency while keeping size and weight to a minimum. 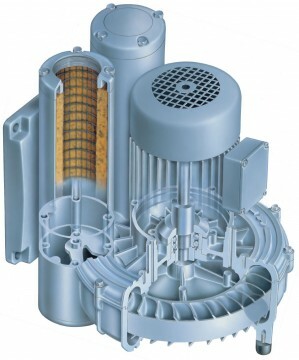 Modular design flexibility is the key to a single- or multi-stage version with AC or DC drive. A leap forward in technology ultimately expressed in a clearly defined, slim-line exterior.